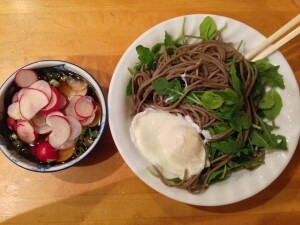 Browse: Home / Cold Soba Salad Luciable Style! Cold Soba Salad Luciable Style! After a day of questionable food choices (scone for breakfast, 5 chicken wings for lunch, and Animal Fries from In and Out to tide me over from 2pm to 10:30pm), I figured I should probably eat something a bit more healthful to wipe my food conscience. It was too late for take-out or grocery shopping, though, so that left me with only one choice. Random put-together fridge raid snack! ..and you’ll end up with something like this! 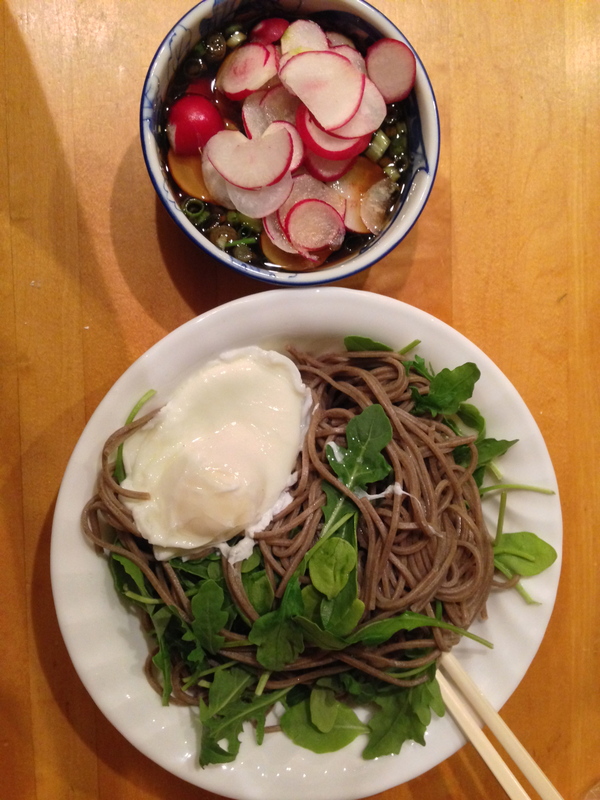 To Eat: grab a chopstickfull of noodles and arugula, and dunk it in the radish onion sauce. Pick up some radish and onion before shoveling into mouf! The spicy radishes lost some of their bite after sitting in the soba sauce, and the green onions of course added their wonderful oniony-ness to the dish. There were a lot of strong, peppery, biting flavors that I could just feel cleansing my system. If the arugula + radish combo ever got too overwhelming for my palate, I’d just go for a bit of the creamy poached egg to smooth it all over. My brother has always told me that my food combinations are a bit odd, but I think this one actually came out pretty well – if a bit inauthentic. Give it a try and let me know what you think! I love to cook and eat, but above all, I love to eat with friends and family.